After nearly three years of sunrise and sunset walks with no one to share my hot chocolate with, it seems time again to foray into the world of dating. The last time I forayed, it ended in a marriage briefer than the Chequers Brexit deal, so I foray with caution to say the least. I put together some profile pictures largely consisting of me on a mountain. I add one of myself in a dress and with combed hair for good measure, but I don’t really have time to date anyone who isn’t outdoorsy and I don’t want to be done for misleading trade descriptions. I worry briefly about my eyebrows, which are the same colour as my hair and get slightly tweaked at the salon down the road every year before Christmas, and sometimes in July if I remember to book in. My eyebrows don’t look like they’ve been shaped with fuzzy felt, like lots of eyebrows going about the place today do. I wonder what men think about eyebrows and recklessly post my profile anyway. My caution comes with good reason, it quickly becomes evident. If I haven’t got much wiser in the years since the date that led to the Chequers-deal marriage, the guys online sure haven’t either. Dear Lord, grant me the wisdom to know where to begin with this lot. The guys who post photos with their kids; I could be a crazy lady! The guys who post photos with their exes; um, did I miss something here? The guy with his arm around his ex, her face helpfully scrawled out with black marker. I genuinely can’t work out if this is better than the exes with the fully visible visages, and stop worrying about my eyebrows. The guy I nearly go on a date with, but back out when he over-shares his daughter’s personal stuff, having never met me. He calls me ‘extreme’ and says he was trying to prove what a good dad he is. My heart aches for an 11-year-old girl whose dad thinks it’s ok to use her stuff to impress strange women, then it sighs for me a little bit too – this isn’t quite the flirty chit chat I’m hoping for at this fledgling stage. And the absolute worst, or, depending which way you look at it, the best; the guy who lists as his interests – in this exact order, mind you – ‘golf, breasts and steak’. I find this beyond offensive. I gave up red meat last year, and we all know golf’s a good walk ruined. 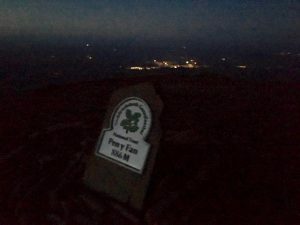 I hike up Pen y Fan at the end of a long day with a guy who makes me laugh, doesn’t have blue hair and hasn’t given away anything about his daughter. 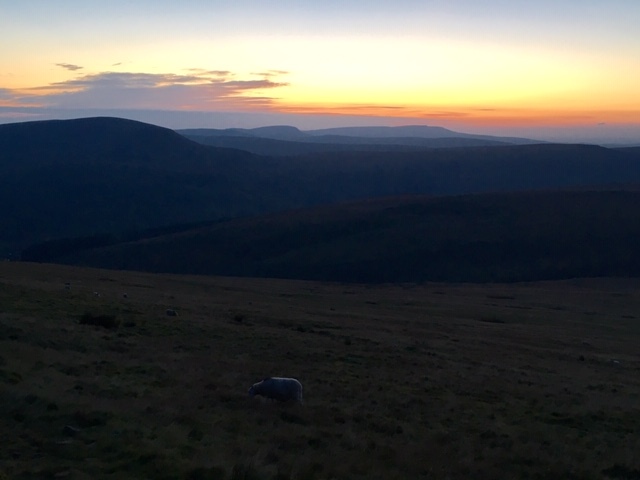 We climb under a salmon sky to watch the Brecon lights dance below, then retreat under layers of stars back to warmth, hot chocolate and dating stories. He still makes me laugh but he’s not for me and, as he gives me a hurried hug at the end of the night, I suspect I’m not for him. I wonder if it’s the eyebrows and drive home to Lionel. And here’s my theory about those men online who say they want someone outdoorsy. I think they think they want someone outdoorsy, and they do – but only to borrow. They want a girl in muddy boots for hiking and hot chocolate, but then to go home to a lady in a dress and proper eyebrows. And, as I’m far too old for fuzzy felt and definitely too young to take on some guy’s parenting problems before we even do the flirty bit, that’s a very disorientating place to find myself. I admire your courage! All my relationships began when I met someone, asked them out, and went from there. Blind dating sounds potentially scary, but I know it’s perfectly normal today. If I may offer an opinion? 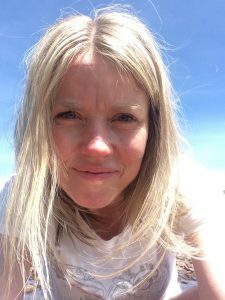 There is outdoorsy, someone who likes a walk at weekends, holidays, etc, then there is a professional outdoors person, which is what you are. It’s your living, your hobby, your life. Even to me, who works as a Ranger, your outdoor life appears at the extreme end of outdoorsy. Most chaps may not have the energy to keep up with you. And don’t tattoo your eyebrows on unless you wish to look like Daniel Radcliffe! Au naturel is best! Thanks Keith; I appreciate your viewpoint! Yes, I am coming to realise that most guys who say they like walking mean they will stroll one mile to a pub… As for Daniel Radcliffe, it’s definitely not the look I’m going for – but it would sure get me noticed! Brilliant! Just brilliant! Reading this I have a grin The Cheshire Cat would be proud of! Pure class Bec, made me smile. Don’t settle for anything less than the best, you deserve that. The true one won’t have noticed your ‘eyebrow challenge’ and will only have reflected on the good time he’d had!